Do you like to see the world while riding your bike most of the time? Then this is your programme. 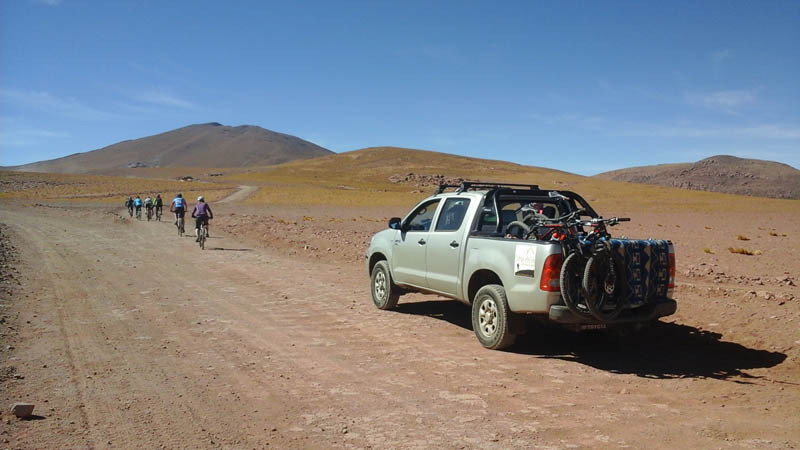 Aimed at bike lovers, it combines spots close to the Pacific Ocean, the Atacama Desert, the Andes Mountain Range and the Altiplano. For lodging we combine nights at hotels, family hostels and camps. Days of progressive ascent to acclimatise to the altitude, with flat land and others with a lot of gradient. With a permanent support car, you pedal as much as you like. 900 km of BTT, maximum. 14 cycling stages, with days between 28 and 100 km per day, in accordance with each person’s ability. Lauca Biosphere Reserve, Salar de Surire salt flat, Isluga Volcano National Park, Salar del Huasco salt flat and the oasis of Pica. 3 mountains on the journey, the highest at 5,070 masl. Programme is adapted to the ability of each client, but the cycling days are between 28 km (minimum) and 100 km (maximum) per day. Day 1: Santiago – Arica. Transfer to the hotel. Night at hotel. Day 2: Arica – Valle Azapa – Arica. Visit archaeological museum Azapa (25 km de MTB). Night at hotel. Day 3: Arica – Codpa. Transfer (70 km). 1st Stage: Panamerican crossing (1,280) – Codpa (1,850). 47 km of MTB. Night at hotel. Day 4: Codpa – Ticnamar. 2nd Stage: Codpa (1,850) – Ticnamar (3,200). 67 km. Strong gradients upwards and some downwards. Ofragía Petroglyphs. Night at camp. 3rd Stage: Ticnamar (3,200) – Belén (3,260) – Socoroma (3,060). 73 km, of those, 57 are dirt roads and 16 paved ones. Strong gradients both upwards and downwards through mountain landscape with beautiful views. Night at family hostel. Day 6: Socoroma – Putre. 4th Stage: Socoroma (3,060) – Putre (3,500). 28 km. (5 km of byroad and 23 km of paved road with a lot of traffic. The whole route is upwards, except for 2 km downwards. Afternoon rest. Night at hotel. Day 7: Putre – Quebrada de Allane Canyon. 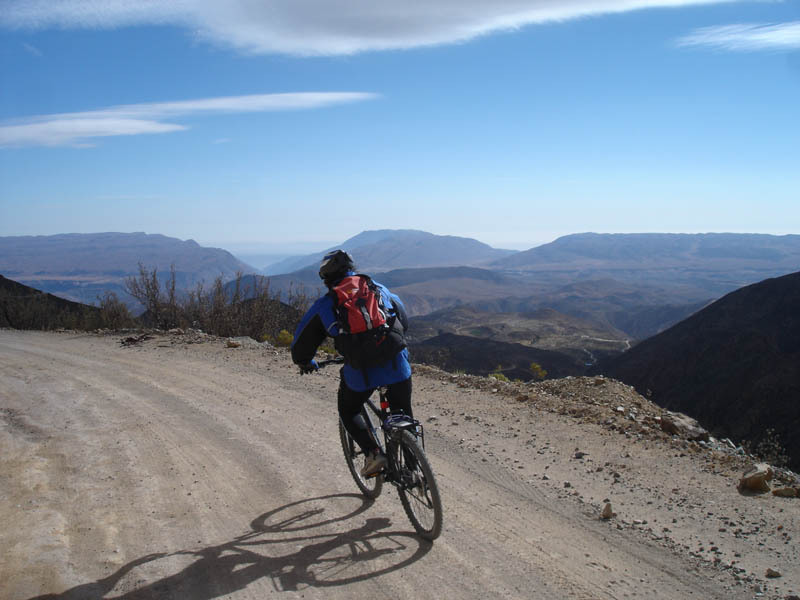 5th Stage: Putre (3,500) –Taapaca Pass (4,790) – Allane (3,620). 43 km. Of these 30 are upwards to the Taapaca pass with a gradient of 1,290 m upwards and 13 km of negative gradient of 1,170 m. Dinner. Night at camp. Day 8: Quebrada Allane Canyon – Parinacota. 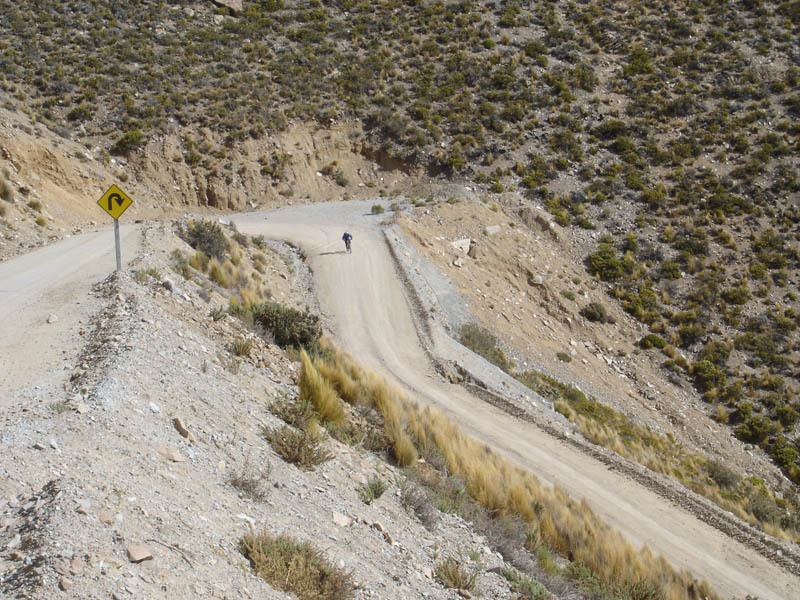 6th Stage: Quebrada Allane (3,620) – Parinacota (4,400). 68 km. The biggest part is flat with small differences in altitude. Altiplanic landscape. Night at family hostel. Day 9: Parinacota. Rest day and visit by car to Chungará Lake and Cotacotani Lagoons. Night at family hostel. Day 10: Parinacota – Guallatire. 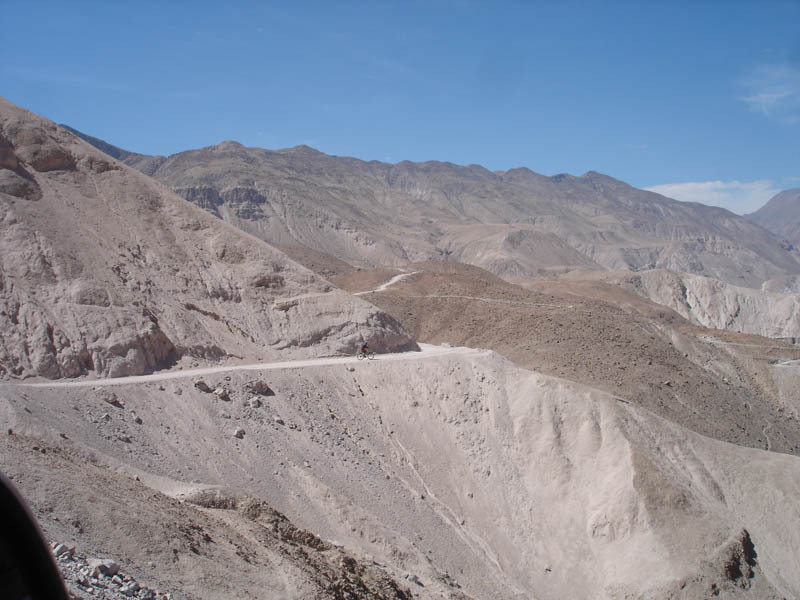 7th Stage: Parinacota (4,400) – Guallatire (4,300). 66 km. Flat land at around 4,350 masl, with slight altitude differences. The whole day is set within the Lauca Biosphere Reserve. Night at family hostel. Day 11: Guallatire – Salar de Surire salt flat. 8th Stage: Guallatire (4,300) – Salar de Surire salt flat (4,350). 75 km. Dirt roads with moderate altitude differences. We continue the whole day within the Lauca Biosphere Reserve, in the Altiplano. Night at camp. Day 12: Salar de Surire salt flat – Colchane. 9th Stage: Salar de Surire salt flat (4,350) – Colchane (3,720). 100 km. Pass at 4,735 masl, crossing of Isluga Volcano National Park. Night at family hostel. Day 13: Colchane – Lirima. Transfer from Colchane to Cariquima (28 km). 10th Stage: Cariquima (3,770) – Lirima (4,100). 64 km. 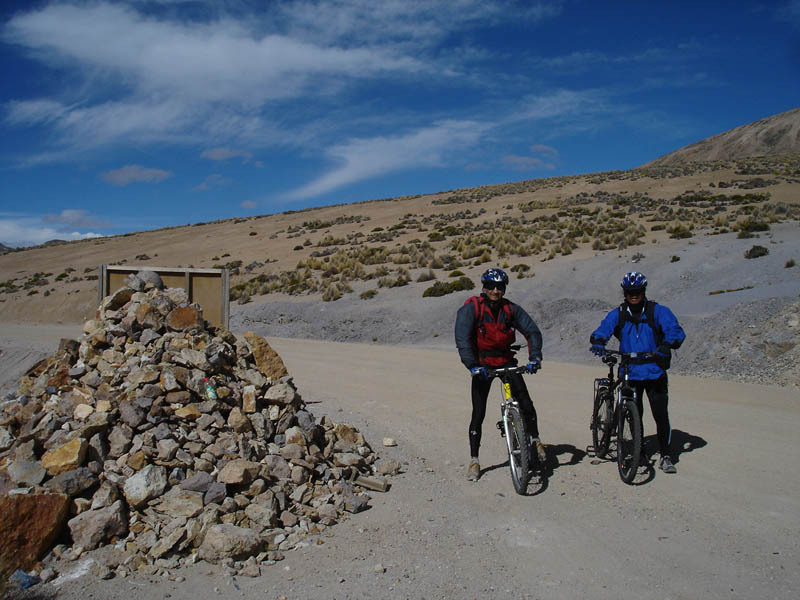 There are 40 km of ascent, crossing of the Sillajuay pass at 5,070 masl and 30 km of descent/flat. Night at camp next to the hot springs. Day 14: Lirima – Salar del Huasco salt flat . 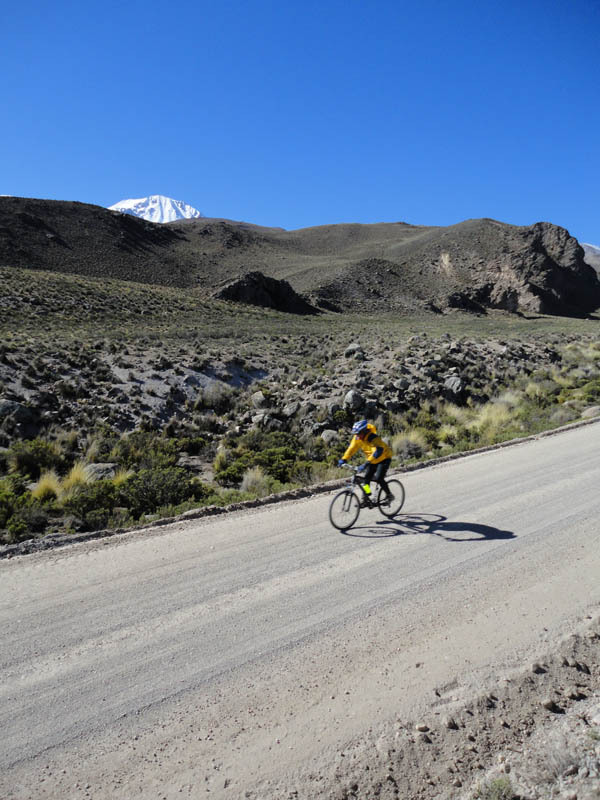 11th Stage: Lirima (4,100) – Salar del Huasco salt flat (3,800). 56 km. Quiet day with flat land with imperceptible descent to Salar del Huasco salt flat. Night at family hostel. 12th Stage: Salar del Huasco salt flat (3,800) – Pica (1,325). 61 km. 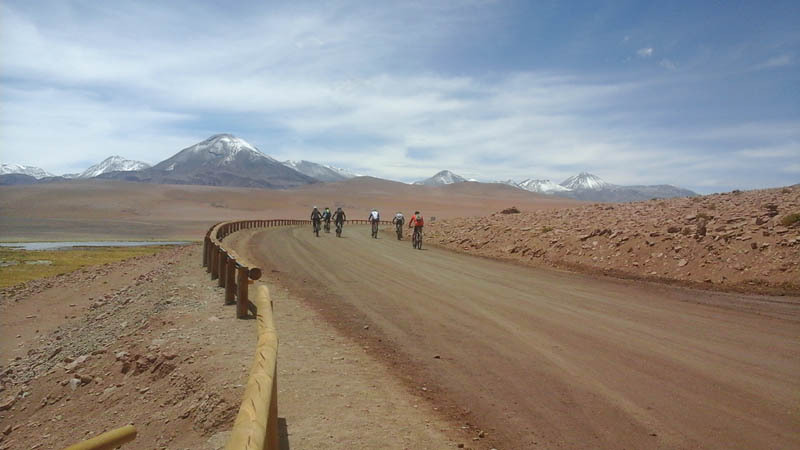 There are 4 km bordering the salt flat, then 11 km of ascent and finally 46 km of descent to the oasis of Pica. Night at a hostel (double rooms with private bathrooms, hot showers). Day 16: Pica – Pintados – La Noria. 13th Stage: Pica (1,325) – La Noria (970). 85 km. Desert landscape. Visit Pintados geoglyphs. We enter the “pampas” zone, typical landscape where nitrate is extracted. Dinner. Night at camp. Day 17: La Noria – Alto Hospicio – Iquique. 14th Stage: La Noria (970) – Iquique (0). 55 km. Stage of desert with descent to the port of Iquique. 30 km on dirt roads with slight altitude differences + 25 km of descent to Iquique. Night at hotel. Day 18: Iquique. Rest day in Iquique. Night at hotel. Day 19: Iquique – Santiago. Transfer out to the airport of Iquique. Looking something different? Contact us for a tailor-made travel!